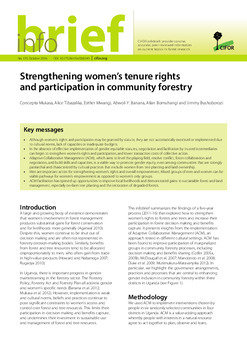 The consolidation of the current legal regime for the protection of collective land tenure in Colombia is the result of a series of processes social, political, economic, cultural, and legal that have shaped and restructured collective land tenure, both as a concept and as an institution. The current legal regime of collective land tenure protection in Colombia is based on the inclusion of the principle of the social rule of law in the Colombian Constitution of 1991 and its development in the current context of transitional justice and peacebuilding. Collective land tenure in Colombia can be seen as political and legal recognition of the territory and identity-based rights of indigenous people and Afro-descendants, notwithstanding some prerogatives for campesinos in the context of campesino reserve zones. 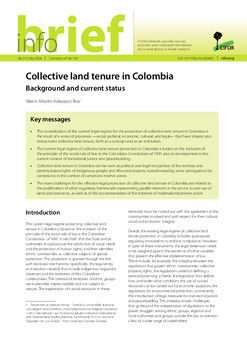 The main challenges for the effective legal protection of collective land tenure in Colombia are related to the proliferation of other regulatory frameworks representing parallel interests in the access to and use of lands and resources, as well as of the accommodation of the interests of multinational private actors.